The Devialet Gold Phantom is one of the most pleasing all-in-one speakers we’ve ever lived with - for both the ears and the eyes - if you can afford one or, daresay, a pair. Do you really need this many Watts of power? Gaming fans might think the Devialet Phantom looks like a real-life replica of Ghost from smash-hit title Destiny, but audiophiles will know the high-end French manufacturer doesn't speak in vocoded Peter Dinklage, but instead top-end, crystal clear audio. And now, in its Gold guise, in extra-loud 4,500W form. We'll still draw on that Hollywood star comparison though: like the futuristic floating orb from the game and the small-yet-mighty man behind its voice, the Phantom delivers futuristic funk from its space-age design with far greater aplomb than its small stature might otherwise suggest. Oh yes, the Phantom can certainly roar. But the £2,190 price tag, per unit, is enough to make you scream. Scream in joy, but of course, because the Gold Phantom, quite simply, sounds exceptional. Well, it does once you've got over the setup stage anyway. If you want to use a single Phantom then for Wi-Fi use it must be Ethernet-tethered to a router. This then means you can control it via multiple devices such as phones, laptops, and beyond via the Spark application, so long as they're on the same network. If you're ok with just Bluetooth use from a single device, then all you need is a mains plug socket. One way to get around repositioning your router would be to use power line adapters in plugs around the house. If you want to use a pair of Phantoms - or more in multi-room setup, which is also catered for via Spark - then you'll need to buy a separate box called the Dialog (priced £249). This hard-wires via Ethernet to your router, to create its own network - leaving you free to place the Phantoms where you please, so long as they have individual power sockets, of course. It's a far more elegant solution, despite the extra expense. And we might sound mad for suggesting you go and buy almost £5,000 of gear, but the Gold Phantom setup as a pair sound phenomenal in stereo. Now the process of setting up the Gold Phantom should be simple, but we had some issues with firmware differences between the box and individual speakers. A number of resets and fiddling around and, eventually, we got it all sorted. The setup process is almost kind of fun. Why? Because it's like the Phantom has a personality. It "sings" a tone to let you know it's ready for setup, which progresses through the Spark-based application process. You have to rest a hand on its "forehead" to confirm things, which results in the speaker makes a hiss sound and pumping out its side "gills" (ok, cones) like some robotic pufferfish. It's quite a beautiful thing. Prior to now we've been to private demonstrations of the step-down Silver Phantom, which we thought was an exceptional speaker. What we were particularly keen to do with the Gold Phantom was to actually live with a pair of the speakers. To see how much they could dig into our lives within the 72-hours of time we were permitted. To see whether they would glitch out. And to see how often the neighbours would come around and tell us to shut the hell up (they're too polite, because the answer would otherwise be "a lot"). The only notable glitch that we've had - ignoring the laborious setup - has been when moving the Dialog box, causing the Phantom to cut-out. But you don't need to move this box, so that's our bad. Otherwise the connection remains solid, network permitting, with the Dialog box's range decent. We've moved the Gold Phantom around from room to room, too, to get a sense of them in different spaces. After a long day of playback we did get an issue with one or other Phantom intermittently cutting out, but this was smoothed out by the next day, so we can only assume was down to a network issue. One thing that you'll have to get used to with Devialet is its Spark software, as we've mentioned. This will act as the major control centre, which can pull in your personal music library from multiple sources - streaming services (Spotify, Tidal, Deezer, Qobuz, and more), servers, network drives, phones, laptops, and so on - and allows for quick switching between devices too. If you're playing some tunes from a laptop when working from home, for example, then you can pick up your phone and continue to interact via the app there. It's seamless. We've often just used our phone as a remote control, to adjust the volume or flick between tracks and playlists. Although there's no subwoofer option within the Phantom arrangement it's of zero consequence: the Gold delivers burbling bass; so much that its two side woofers pulse manically when at volume - but without causing the unit itself to vibrate. It's a thing of magic. Devialet puts engineering to point: vibrations are maintained and projected through the cones, sidewards, meaning actual speakers avoid wobbling about. Indeed, even with a hand atop one of the units with it turned up super-loud there's barely any direct motion. We even rested a phone on top where it happily balanced. You'll need to try it for yourself to quite believe how well sound is contained and, equally, projected outward from these speakers. Because that bass really can be huge. With sub bass delivered right down to 14Hz you'll often hear things in some modern productions that you didn't know existed. But it's also so clean and smooth. And kind of addictive. For best results you'll want to invest in a Tree stand (£339) to reduce ambient resonance and better project the sound. We've seen the Gold Phantom in this setup at an earlier demo. For the purposes of this at-home review, we've simply rested the speakers on the floor or available surfaces - they sound great even at ground level, unusually, because they're slightly upturned. Plus they're bonkers loud so could fill a small stadium, let alone a living room. But it's not all just about the bassiest of bass. The clarity throughout the range - which is capable of delivering through to 27,000Hz at the top-end - is truly impressive. And with support for 24-bit/192kHz (through the network, not Bluetooth) ultra-high quality is catered for. From mid-level vocal harmonies, to the of harps and hi-hats, everything has sounded spot on. The top-end sprinkled from that front-firing titanium tweeter - which is sheathed in an almost mythical-looking magnetic cover design - avoids being over-sharp like some other high-grade speakers. It's just about perfect. One last point is that there's no equaliser in the Spark app, which means you have to make do with the way music is mixed. Purists will be happy with that, but we like to tinker with settings here and there - or for certain recordings, anyway. There is a Night mode, though, which cuts out the lowest of bass to avoid disturbing others. 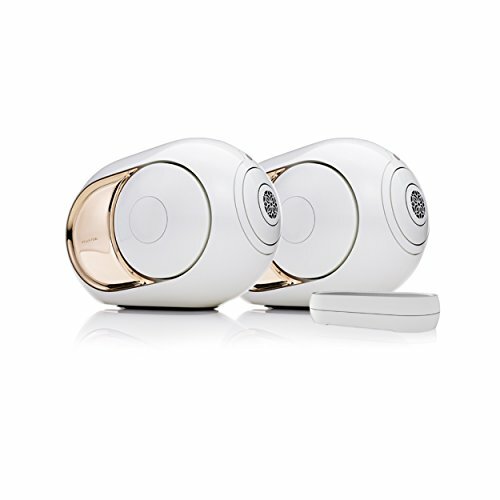 Devialet Gold Phantom review: What's Watt? One of the main points about the Gold Phantom is that they're 4,500W. Which is huge. 108dB huge - which is rock-concert loud or, as a quick Google will tell you, on par with the coqui frog croak of Puerto Rico. You learn something new every day. If you've got a massive space to fill then the Gold are an ideal choice. If not then, well, you may as well look to the 3,000W Silver Phantom (£1,690) or 750W standard model (£1,390) and save on the cash. If you have a multi-room setup then different rooms will perhaps make better use of different models. And if you're super rich then up to 24 Phantoms can be utilised. That's the thing about the Devialet Gold Phantom: for most people the slightly more affordable and lower-spec models in range will make better sense. And we think the silver and white finishes actually look better than the Gold's coppery-gold side panelling. The setup is laborious too. But once settled in the futuristic-looking Phantom is a simply stunning speaker experience though - for both the ears and the eyes. Living with a pair has made us want to keep them forever. At their best a pair of Gold Phantom speakers delivers that rare, emotive kind of music reproduction. It's like liquid, audible gold... but about as expensive too.